Here at Dax Central I am working very hard on the edit of Part 2 of The Legend Of Pope Joan which is set in Athens. And I am pleased to tell you that it should be available in approximately three weeks time. I have been thrilled to bits with the sales and feedback for Part 1. I must admit that I was a little nervous about the comments I would get about this new novel because it is so different from After The Night. Writing 'QueerFic' rather than 'LesFic' is a bit risky because it crosses boundaries that some readers are not prepared to explore. However, so far so good on the reviews - although it is not 'pure LesFic' many of the same people who liked After The Night have said that they love Joan's story so far. And in addition, I have found new readers too - some who have particular interest in Pope Joan as a 'disputed historical figure' and others who aren't particularly into romantic fiction but love stories about strong lesbian/queer women. The new novel by Rachel Dax is an ambitious three-part story. To start - Dax is an excellent storyteller. That fact was realized by reading her first book, After the Night, which was released in 2010. So being captivated by the writing style in her latest work isn't a surprise. It is filled with intrigue and excitement that rapidly and deftly move the story. In Part 1, the life of a thirteen-year old Joan is dramatized in believable way. Dax brings the character of Joan together beautifully. She grows to be an intelligent, wise, and kind young woman. Because of the atrocities against women that occurred during the Dark Ages, being born female was treacherous. Joan knew she wouldn't be free to study in libraries, nor could she be devoted to the religion she revered. Joan's education could not be continued unless she simulated being a male. She had a yearning for knowledge that was worth the perilous decision to disguise her gender. Escaping the confines of being a woman meant she needed to learn 'maleness.' Because of fear she might be recognized - incognito, she would need to relocate. It required she and her companion, Michael, flee from their homeland. Their journey is filled with suspense. Within the corrupt, violent nineth century, danger was around every corner. Luckily, Joan and Michael met another traveler - an entertainer named Amadeus. He assisted them as their path repeatedly crossed with scheming villains. The character development of the trio is brought alive with marvelous dialogue. They take the reader with them on the travel toward their destination of Athens. As they trek toward the seminary, Joan's wisdom and courage increases with each adventure. The story of Pope Joan is often called legend, fiction, and historicized folklore. Many versions have been told, dismissed, retold, and so on. If it is urban legend, so be it. This is a terrific, believable read. This is a story made credible by a plethora of incredibly accurate research. The reader is placed inside the story's time and place with enthralling protagonists. The superb, informative and interesting description paints the picture of a place you can reside while reading. Dax fleshes the story out, and keeps it unraveling smoothly. It may be a fictional depiction of a female pope either cheated by history, or exalted by rumor. Either way, this version is fascinating. I found it riveting and I highly recommend it. This well-crafted beginning will be followed by Part 2, and Part 3. And I'm one reader who will be looking forward to them. With the resignation of Pope Benedict last week, the world has been talking a lot about who will next sit on the Throne of St Peter and many a person has said with a wry smile that it should be a woman. If I could resurrect Joan and transport her to the 21st Century I would do so immediately! Happy New Year! I hope that 2013 is a great one for all of us. 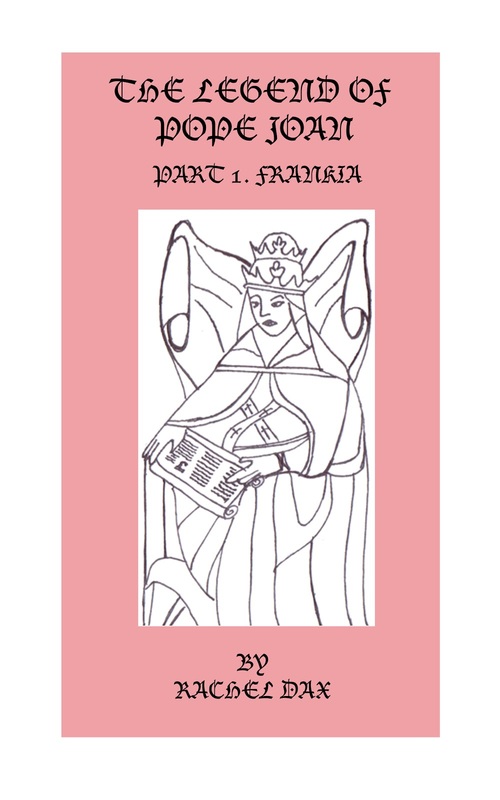 I got off to a fantastic start by releasing the first part of my Pope Joan story just a few days ago. What started out as a play, turned into a novel, which turned into a trilogy! Little did I know that it would become such a massive project, but it has been such a wonderful experience writing it. The research has been so fascinating - a whole period of history that I knew almost nothing about has been opened up to me and Joan herself is like a real person now - someone who I think about and wonder about almost obsessively. In fact I have to confess, I am totally in love with her. I even found myself posting this 'Ode To Pope Joan' on my Facebook Wall, whilst I was writing part 3, where she really comes into her own! You are Pope Joan, my Pope Joan. On reaching the orchard at the far end of the village, she slowed down and once out of sight, grabbed a large stick and began thrashing the ground. “Why? Why? Why?” she shouted, as she whacked the thickets angrily. She was making such a racket that she did not notice the young man approaching her from the left. “Hello, Pickle! What’s gotten into you?” he asked. It was Michael, her favourite person after her father. He was carrying a large basket of apples in one arm and a small wooden ladder under the other. But the sight of him did not cheer her up, even though she had not seen him for a while. Instead of her usual hug, she gave him a shove. “Don’t call me ‘Pickle’ or I’ll pickle you!” she snapped. Michael swayed a little but she had not hurt him. “Sorry, Pickle – I shall never call you Pickle again!” he giggled. She looked at the ground, tears falling gently and a sense of hopelessness pervading her entire being. She remained like that for several moments until she realised that Michael was staring at her curiously. “Pickle, pull back your hair and let me look properly at your face,” he asked. Joan was puzzled, but obeyed. This time she was impatient. “Why, what do you want of me? She stared at him crossly but he did not relent. “Hold back your hair again… that’s it. Yes! Yes! That’s it! !” He shouted in delight, grabbing her arms and trying to dance with her. “Very well. But I still think it’s a good idea,” he said, bending down to tend the overturned basket and handing her an apple whilst swiftly gathering up the rest. She had no desire to eat it yet so put it in her pocket for later. Then she turned on her heel, without saying goodbye, leaving him staring after her. Her whole body had turned to pins and needles and she could barely walk in a straight line. No! I must not think on it… she said to herself as she imagined being disguised as a boy. But no matter how hard she tried, she could not purge the sinful vision from her mind and so started running fiercely towards her house, hoping to distract herself from the flame that had lit up inside her. Part 1 is available on Amazon Kindle either to buy to keep or to borrow from the Kindle Lending Library for free. Part 2 will follow shortly and by late Spring, Part 3 should also be out. I hope very much that you will enjoy this adventure. Many thanks in advance for taking the time to read it. Look forward to hearing your thoughts and reading your reviews!